In a “never-enough” culture, our children will always struggle with feelings that they are never good / smart / pretty / rich / successful enough. But we as parents can show them the way to “be enough.” By first accepting and living out this truth in our own lives. Let’s look at what worthiness-based parenting entails. Worthiness-based parents see that it is not just about academic / non-academic performance, they emphasize the whole person and is often more concerned about your character and values (your inside) than your performance and achievements (your outside). Worthiness-based parents give each child room to pursue their interests and will teach them to pursue these gifts and talents because they should be good stewards over what they’ve been given. They will not groom their children in these areas just because it is a way to get them into a good school. Worthiness-based parents recognise that each child is unique and is committed to helping them find their niche in life, rather than investing tons of resources to “designing” them to become the children they want them to be. Worthiness-based parents emphasise and express their unconditional love for their children. Worthiness-based parents practise self-love and self-compassion. They don’t beat themselves up for things outside their control and they make the best out of what they’ve been given. Worthiness-based parents know that tuition centres often prey on their deepest fear, that of failure, and they try to balance this knowledge when making decisions on whether to seek external help for their children. Worthiness-based parents will not bail their children out of their own mistakes, but allow them to bear the consequences of their actions. They also don’t take their kids’ failures personally. They see it as a part of growing-up, and focus their energies on tackling the problem. They also use it as a valuable teaching moment, and they do their best to support their children emotionally. Worthiness-based parents believe there are more ways than one to success, and they will not try to squeeze their child into any one single path. Instead they will work with their child to find his or her own path to success, based on an understanding of their child’s unique make-up. Worthiness-based parents know that it is not helpful to compare their children to other people, and will resist the temptation to do so. Worthiness-based parents emphasise growth and effort, over results and perfection. They also encourage their children to run their own race. Worthiness-based parents will set high expectations that are also realistic, and achievable, while bearing in mind each child is made and wired differently. Now I know this list looks hard to do, and there are times where we will fall short. But these are things worth being honest with ourselves about, so that we can work with what we have, and know where to improve. 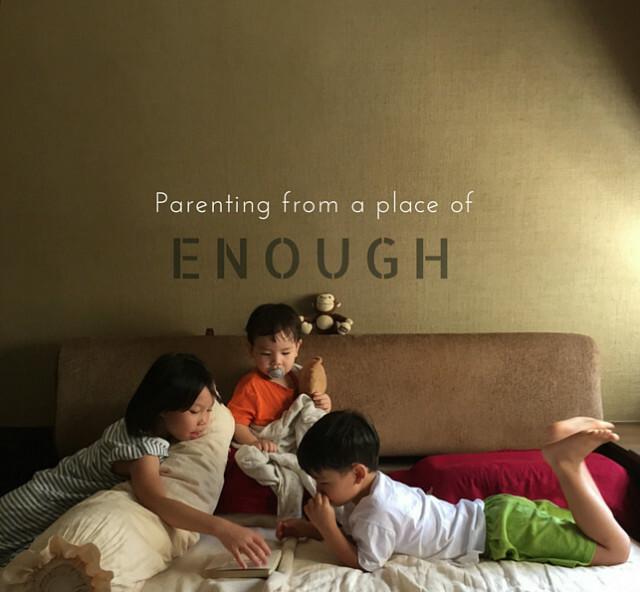 The truth is that we can all parent from a place of enough. We all have this worthiness-based parent in us. In order to embrace such a “we are enough” mindset, we need to love and accept ourselves first — we can’t give away that which we don’t possess. To parent from a place of enough, we need to walk away from an unhealthy spirit of competition and discontentment, and lean in to a life of contentment and satisfaction. What would you add to this list? What are the ways you practise “I am enough” mindset in your life? I can really identify with this! A timely reminder that sometimes, as long as our kids have tried their hardest, it’s enough. Thank you for sharing, Madeline. I too need such reminders from time to time. We do our best, and the rest is God’s hand. I guess it’s the in-between – the part where we have to let go — that’s the hardest. I have so much to learn, so many ways that I should practise worthiness-based parenting. Thank you for penning such a convicting post. Parenting does get more challenging as the kids get older and when they start to experience the pressures to do better than others, academically or otherwise. I’ve so much to learn in this area if I want to be a good model for Sophie. Much food for thought. Susan recently posted..I survived my first 10km run! It does get more challenging and stressful for both the child and parent alike! We all have new things to learn, Susan. Let’s jiayou together!